Guaranteed To Stop Your Dog's Pulling – OR YOUR MONEY BACK! Now Available In Blue + Red! SATISFACTION GUARANTEED OR 100% OF YOUR MONEY BACK + FREE RETURNS! A Simple Easy Way To Stop Your Dog's Pulling Fast! "MAGIC! This harness I swear works magic! After putting on this harness and walking just a couple of feet, no more pulling, no more anxiety, no more barely being able to breathe and choking themselves out! ...You will love walking your dog!" - Ashton V.
Everyday leash pulling is common and has been proven to cause a 60% chance of significant neck or back injury for dogs. That pain can actually worsen their behavior over time. Exactly what you don't want! The bodycollar's unique patented design stops pulling by applying gentle pressure on the body away from the neck keeping your dog safe and happy. 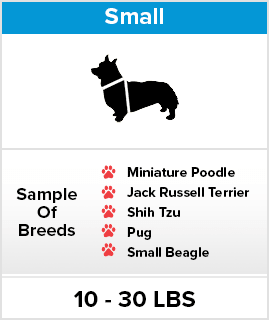 "Best harness we've used! It was almost as if she knew I could control her better on her walks as soon as it was on and she pulled far less than before. Can't recommend this enough! - Scott C.
Real People, Real Dogs, Real Results! "Thank you for developing this miracle device!" 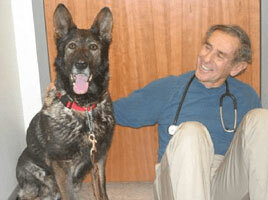 "Before we got the bodycollar, she pulled and it was impossible to work with her. Now that Abbey has the bodycollar, she never even tries to pull and it is a joy to walk." "I will continue to recommend the bodycollar." 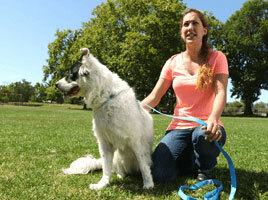 "With my bodycollars I can walk all four of my dogs with no problems. They don't chafe or impede their walking or running. It's such a relief to know that I'm not hurting them." "If I put a bodycollar on a dog that pulls I get instant results. Unlike a harness, there is no pinching of the shoulders and the movement is free and normal. 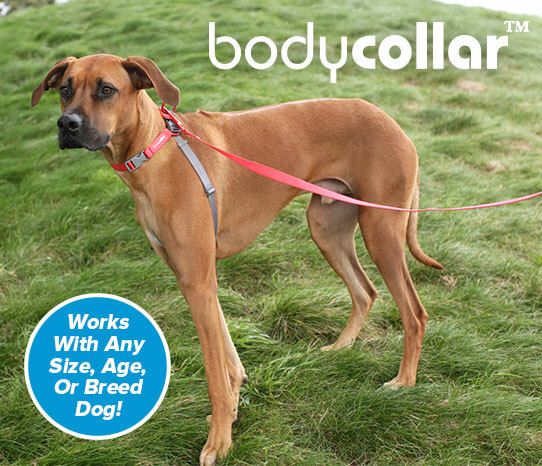 I recommend bodycollar to anyone who has a dog that pulls." 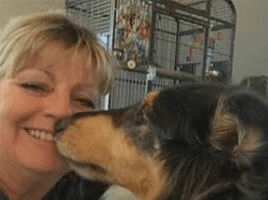 Trish Wamsat, a professional dog trainer with over 35 years of experience in training has committed her life to helping all types of dogs become more peaceful and obedient. Trish found in her training that if she transferred pressure away from the dog's neck and exerted gentle but noticeable pressure on their chest, she could better control a dog’s behavior through a positive, non-painful means of feedback. The result of years of experimenting and refinement is the remarkably simple and effective bodycollar; so novel it was awarded a US patent. 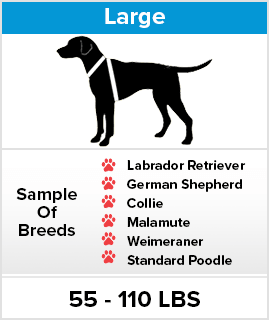 It works for all sized-dogs and is fully adjustable and attaches in just seconds. Literally, it does all the hard work for you. "This is the only no-pull harness that we've tried that really worked as advertised. It has made walking the dog a new pleasure and she reacted in a positive manner immediately. 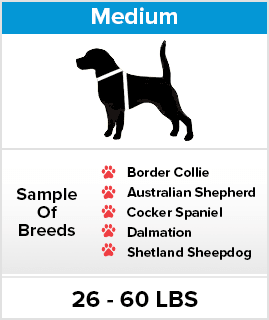 I would highly recommend it for all types of dogs." – Robert J. Still Unsure Of The Size? CLICK HERE! "No more pulling on the leash! 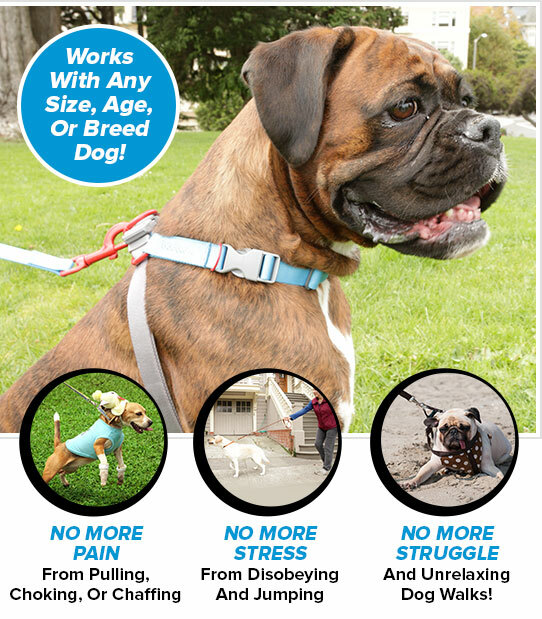 If you have a dog that pulls when you go for a walk, this collar works great! No pain, no choking or pinching. It just works with the way a dog reacts. Great product! - Amy A. † FREE Shipping for US mainland only. $11 USD Surcharge for HI, AK and PR and Canada. $18 USD Surcharge for all other destinations. USPS Priority Mail.